The prestigious title of UK Champion has gone to Kent butchers JC Rook & Sons Ltd for its Battle of Britain Memorial Sausage. 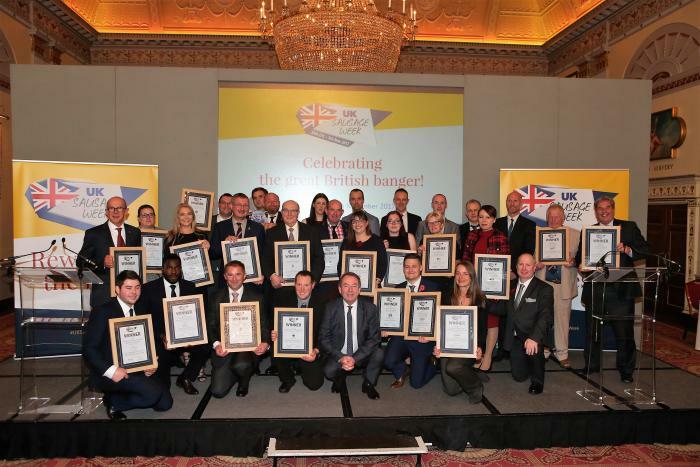 The winners of the UK Sausage Week Awards were announced at a special celebratory lunch at Plaisterers Hall in London on Monday. Antiques expert, TV presenter and UK Sausage Ambassador Eric Knowles presented butchers, supermarkets and manufacturers with their winning trophies. A total of 27 best banger accolades were handed out, with the Co-op winning the Retailer:Traditional category with its Butcher's Choice Cumberland Sausage. Waitrose was a clear winner in the Retailer:Innovative section. Other independent retail butchers up and down the country won in respective regional categories and in Foodservice, Traditional and Innovative winners were Campbells Prime Ltd and Solent Butchers Ltd respectively. The awards marked the start of this year’s UK Sausage Week, an annual week-long celebration, showcasing the best of British bangers. Over 400 different bangers arrived at The Regional Food Academy at Harper Adams University for two days of judging in the run up to UK Sausage Week. The sausages were assessed in their raw state and cooked by professional home economists, according to the maker’s instructions. Pigs, all under the watchful eye of head judge and UK Sausage Week’s supremo ‘Sausageologist’ Keith Fisher.